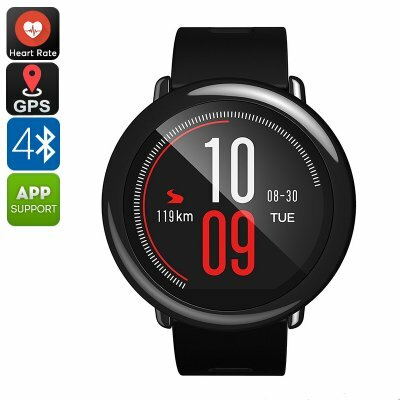 Successfully Added Xiaomi AMAZFIT Bluetooh Smart Watch - GPS, PPG Heart Rate Sensor, Push Notification, IP67, Pedometer (Black) to your Shopping Cart. The Amazfit Bluetooth watch from Xiaomi is a beautiful timepiece that blends classic circular design with a sporty appearance and packs if full of technological wonders. The Amazfit Bluetooth watch brings science to your workouts. A PPG heart rate sensor measures the beating of your heart so you can measure the intensity of your workout. Meanwhile, the pedometer can track your activity counting the steps you take, instance covered and speed. The watch can wirelessly pair with Andriod or iOS smartphone via Bluetooth and will show you incoming calls, text and app notifications as well as sleep monitor and weather forecast. A built-in 280mAh battery you gives a very respectable usage time that should easily last you all day thanks in large part to it's always on transflective LCD display. This is a big energy saver as it doesn't need to use the backlight so often as it utilizes the ambient light around it to light up the pixels. With a 320x300 resolution, the display is a joy to look at and brings all the details you need onto the one home screen. An ip67 rating on the Amazfit sports watch equips it for use outdoors and in all weather conditions and you won't need to take it off to shower or when washing your hands. The wide silicon wristband if exceptionally comfortable and with its impressive looks, the watch can be worn to any occasion. The AMAZFIT Bluetooth Smart Watch comes with 12 months warranty, brought to you by the leader in electronic devices as well as wholesale Bluetooth watches and fitness trackers..